1. Cut slits, about 1/2 to 1 inch deep, across the top of the pork loin. Sprinkle all sides and inside the slits with salt, pepper, and 1 teaspoon of cinnamon. Put slices of apples into slits in the pork loin. 2. Scatter a few apple slices in the bottom of the slow cooker; pour in apple cider (or other chosen liquid). 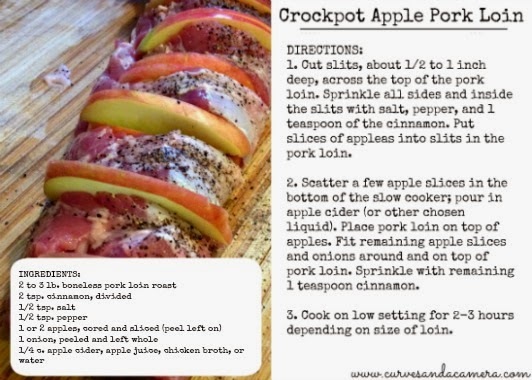 Place pork loin on top of apples. Fit remaining apple slices and onions around and on top of pork loin. Sprinkle with remaining 1 teaspoon cinnamon. 3. Cook on low setting for 2-3 hours depending on size of loin. Adapted from original recipe located on The Kitchen is My Playground.